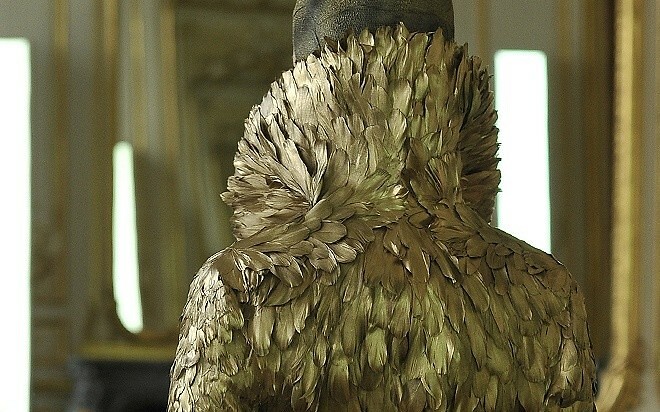 I’ve tried to avoid writing about Alexander McQueen’s Fall 2010 collection for a while now. I felt upon first seeing it that it would be best to let it sit with me before finding and voicing my thoughts. At the time, I couldn’t look at it as a collection, period, not long after his suicide. It is now half a year later, and I don’t feel any differently. His death is something that I, like many people, still can’t believe. It’s simply not real to me; I can’t wrap my head around it, and I probably never will. So I have to wonder: is it possible to look at these clothes without considering the circumstances under which they were shown? I say that I waited because I wanted to see the collection as something that walks by itself. But I’m not sure that I can do so without seeing a dreary shadow following closely behind. The fact is, this was the collection Alexander McQueen was in the process of creating before he killed himself. We would find meaning in anything that had been sent down the runway. After working on this post for an hour, with lots of backspacing and rethinking, and having only two complete paragraphs, I’m still not sure of the best way to evaluate these photos. So much is missing -- the setting he would have preferred, the looks he would have envisioned for the models, and even a number of garments, some deemed inappropriate to show as they were demon-themed. I guess the only thing to do is feel it out. This collection deserves more than to be simplified into an analysis that disregards the story around it, but I don't think I'm the person for that job. 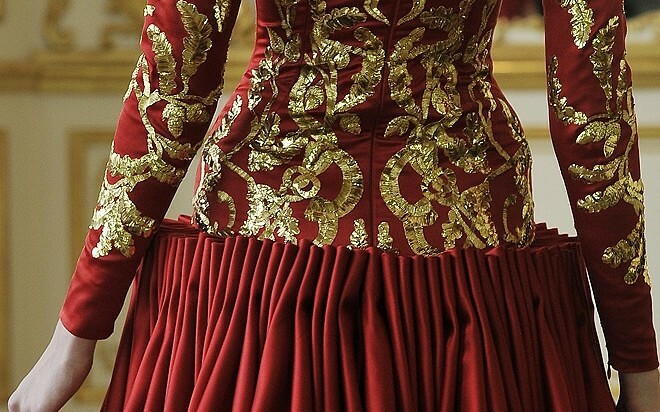 This has been said before, but the collection did sum up Alexander McQueen’s many years of design perfectly. There was wit in the way the image of a feather wing shaped an arm, and emotion in the white half-wrinkled, half-pleated fabric that covered one back. 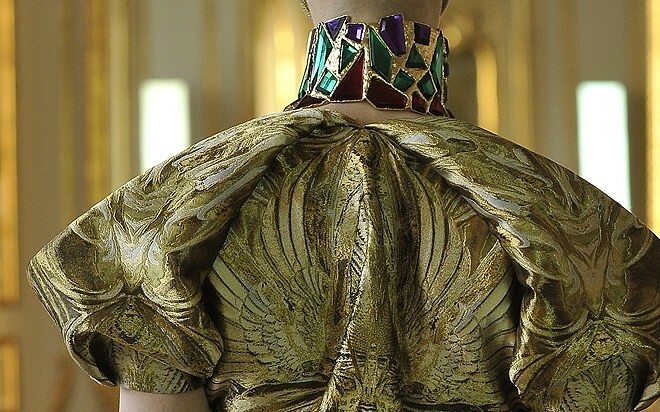 Through beautiful prints, familiar images -- the kinds that come to mind when you think of old paintings in museums -- were shaped to his liking and given another dimension, something McQueen always did with colloquial beauty. 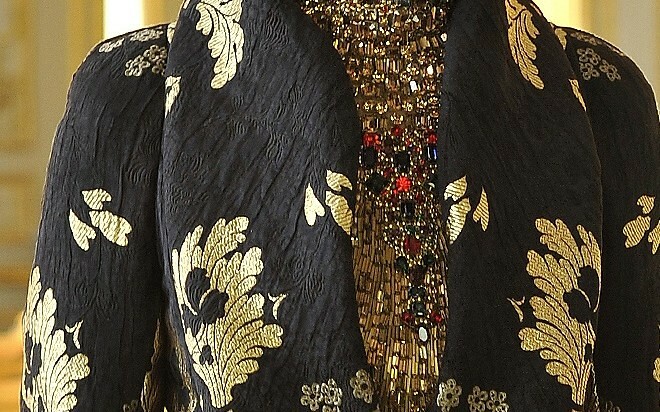 The colors were royal -- blood red, white, black, gold, and silver, with green and purple making appearances only in the form of jagged jewels. 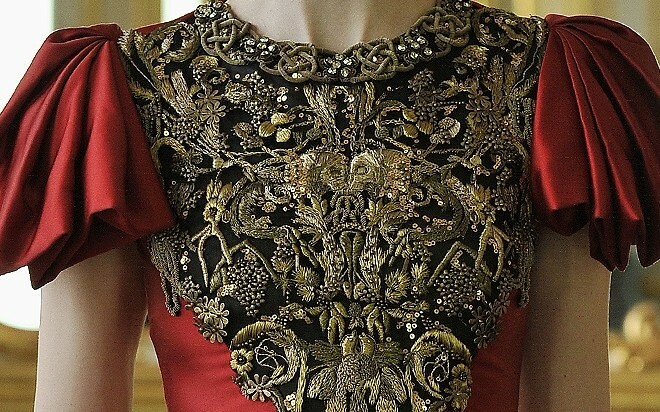 Poetic insect-like draping and folds balanced out intricate beading and embroidery to create stories within fabrics. A statuesque woman in one dress weeps with a white crow over her shoulder and a hand to her chest. As always, you look at it and just think about how amazing it is that a human made this. And that’s about all I can say. I won’t go digging for meaning. It might just be impossible for me to separate the many layers that glide along the floor in the form of a gown from the many layers of the dreary shadow that follows. Enlarge to see the looks, though I recommend clicking here for high quality.